Spider-Man: Into the Spider-verse came out in theaters this week and I had a chance to watch it. 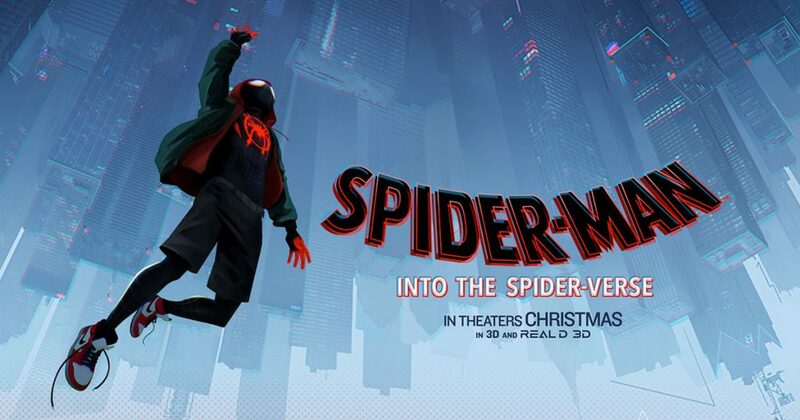 The film follows Miles Morales as he learns how to be Spider-Man through interactions with Peter Parker and several other versions of the superhero. I grew up with Spider-man so naturally, I was excited for the film. I’m happy to say that this is easily the best Spidey film. Yes, even better than Spider-Man 2. One of the aspects of this film that really works for me is the soundtrack. Even on its own the music is good, but the way they incorporated it into the film was on a whole new level. It helped build the atmosphere of the film really well. Daniel Pemberton’s score was also exceptional and really added to the feel of the movie. Furthermore, the way they used “Sunflower” in the film was great and offered some hilarious moments with Miles Morales. Moreover, the humour in this movie works really well. The two funniest characters were Spider-Ham and the noir version of the character. John Mulaney and Nicolas Cage put in great voice performances and their comedic timing was practically flawless. A lot of the humour also relied on easter eggs and other references and I absolutely loved it. Peni Parker also had some fantastic moments. The opening Peter Parker montage was packed with references to practically every Spider-Man movie and as a fan, I enjoyed every single second of it. My favourite was easily the recreation of the Tobey Maguire dance from his third film. I died in my scene. Another scene that stood out was the post-credit. Make sure you stay for it! What I loved most about the story is the balance between humour and heart. Despite being packed with jokes, the movie still took time to actually develop their three leads and have genuinely emotional moments. The characterisation of Miles Morales is near perfect to me and he shares several emotional moments with his uncle and father. In my opinion, the scene in the dorm room was the best in the entire movie. In addition, Peter Parker and Spider-Gwen got proper arcs and the latter is now one of my favourite female characters. Everything she did was awesome and I can’t wait for her spin-off movie. Also, the Peter Parker we get in this movie is so different from any version of the character we’ve seen before. This Peter Parker is in a much more hopeless period in his life and his arc in the film was so emotionally satisfying. His interactions with Miles Morales also gave the movie a lot of heart. The balance in this movie is great, whether it be between humour or drama or giving all the characters enough to do. But, I wish they fleshed out Kingpin more. They did give him a backstory with Vanessa, but after seeing Daredevil (An excellent show btw), I know they could’ve given him more. Considering the movie isn’t long, maybe they could have added another few minutes. However, I completely understand that the focus was on the Spider people so it isn’t a huge issue. If you’ve seen any of the trailers you already the new the animation was going to be awesome. The style was vastly unique and made it feel like I was reading a comic book. Whether it be the divided screen, flipping pages, speech boxes or the explanation for the character origins. This film genuinely felt like a comic book and I loved every moment of it. All the action sequences were great and well-framed and the visuals for the movie were vibrant. Easily the best animation in any movie this year. Overall, Spider-Man: Into the Spider-verse isn’t just one of the best comic book or animated movies of the year. It is one of the best of all time. This film will definitely be in my top 10 by the end of the year and it may even be my favourite. I cannot wait to see more of these characters in future movies. I have learn several good stuff here. Certainly value bookmarking for revisiting. I wonder how a lot effort you set to create any such great informative website. I have been exploring for a little for any high quality articles or weblog posts in this kind of space . Exploring in Yahoo I eventually stumbled upon this web site. Studying this information So i am glad to show that I’ve a very good uncanny feeling I discovered just what I needed. I such a lot unquestionably will make sure to don¦t forget this site and provides it a look on a continuing basis.